High-Definition is the new way of life when it comes to new age video streaming. The most emphatic visual experience can be rendered by the video streaming service that you choose to subscribe or own, provided certain check boxes are marked without compromise on quality of service, speed, pricing and visual enhancements. ‘Powerful Streaming, Incredible Price’ is the motto of Amazon’s latest sensation, the Fire TV Stick with voice control that typically works on a simple ‘plug-and-play’ mechanism. The Amazon Fire Stick is a top-of-the-line streamer that connects to your TV’s HDMI port or your laptop’s USB port with ADB enabled. It is Amazon’s venture into the world of digital media player with its micro-console remote. You can also connect your laptop to Amazon Fire TV stick through same network configuration settings. This works only for Windows devices though. Mirroring your laptop with Amazon Fire TV Stick is also possible for certain laptops. It’s an easy way to enjoy over 4,000 channels, apps and games including access to over 250,000 TV episodes and movies. A smaller version of the Fire TV, which was a Fire TV stick called “Montoya” was released in November of 2014. It is an HDMI-port plug-in first generation release device that replicates most of the functionality of the larger Fire TV. On October 20th 2016, the second generation device release of Amazon Fire TV Stick with Alexa Voice Remote, codenamed “Tank” came into effect. Amazon has revamped its previous set-top box option to a convenient dongle without compromising on its 4K output and bundling in HDR as part of the bargain. It also has a sleek remote that is hassle-free and has a very compact design along with only essential button options for cinch operation. Amazon Fire TV Stick has already pre-empted the budget streaming stick arena with its easy navigation, well-integrated voice control called Alexa and a speedy interface for Full HD television sets. The device is almost easy to set-up and configure with your Amazon or mail account, it also promises quality streaming, provided you have a decent internet connection. Read more about frequently asked questions on Amazon Fire Stick. The dimensions of the fire stick are 85.9 mm x 30.0 mm x 12.6 mm and the device weighs slightly more than 1.1 oz. (32.0 g). The remote measures 4.7 x 1.6 in x 0.5 in and weighs about 2 oz. with 2 AAA batteries inserted (56.9 grams). The device initially ran Fire OS 3.0, based on Android Jelly Bean 4.2. In November 2017, Amazon launched the Fire TV version of the Amazon Silk web browser. In December 2017, Mozilla launched a Fire TV version of the Mozilla Firefox browser. Amazon’s hardware is a little wider than a standard HDMI cable, so in the likely event that it’s too bulky to plug directly into the HDMI port, Amazon also includes a short male-to-female HDMI cable to help it fit. On the side of the stick is a micro USB port for powering the device. If you own a latest HD TV available in the market today, then there’s a good chance it’ll have a USB port on the back for powering such devices, but if not, then Amazon also includes a power adaptor in the box, and the supplied USB cable should be more than long enough to reach your power strip. The remote has seven press-buttons, one microphone button on top for summoning Alexa and bottom six for back navigation, home, list, rewind (at various speeds), play and pause and forward (at various speeds) respectively. The four-way nav pad which allows you to navigate the device’s menus on-screen is a blessing indeed. The device is advanced with MediaTek MT8127D Quad-core ARM 1.3 GHz processor with a Mali-450 MP4 GPU, and support for the H.265 (HEVC) codec. Wireless hardware upgrades include a dual-band 802.11a/b/g/n/ac Wi-Fi with 2×2 MIMO and Bluetooth 4.1. Users can set a PIN to restrict access of mature content by children. Data monitoring feature on Fire TV lets you select viewing quality to manage data use. Amazon stick lets you enjoy movies on Netflix, Amazon Video, HBO NOW, Hulu and more. Dolby Audio, 5.1 surround sound, 2ch stereo and HDMI audio pass through up to 7.1 are the audio super features of this device. The Wi-Fi connectivity specifications are Dual-band, dual-antenna Wi-Fi (MIMO), supporting 802.11a/b/g/n Wi-Fi networks. Support for 8 GB internal storage with 1 GB RAM and features 2x memory of Chromecast Plus. An upgrade with cloud storage for all amazon cloud drive customers is done for Amazon Fire TV stick HD and starts with 5 GB of free storage. For the device compatibility feature, HD TVs that have an HDMI port with the support capability of 1080p or 720p at 60/50Hz is promised. The famous brands for these models include Hitachi, JVC, LG, Mitsubishi, NEC, Panasonic, Philips, Pioneer, Samsung, Sharp, Sony, Toshiba, Vizio, and Westinghouse that are HDCP-compatible. 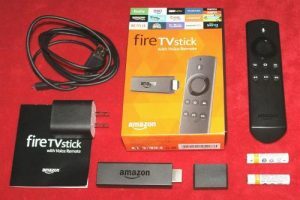 Is an Amazon Account or Amazon Prime necessary to connect to Fire TV Stick? Amazon Prime account is not required to use Fire TV Stick. Access to Netflix, Hulu Plus, and even your Amazon Instant Video purchases is possible without having an Amazon Prime subscription every month by the user. Don’t you just love grabbing some popcorn and watching your favorite show/movies on Full-HD with uninterrupted streaming? Amazon Fire TV Stick is your guardian angel when it comes to that! Amazon Fire Stick holds good for Amazon’s home content and Netflix in terms of search speed, voice and remote navigation, quick buffering, smooth playback, uninterrupted and quality streaming, intuitive and vivid interface that responds well almost always and the quick and accurate voice search feature. Smart devices can also be operated using the Fire Stick remote, benefited by an on-screen keyboard that is more efficient and faster than typing on the remote. Search-time and load-time are almost instantaneous when you scroll through options and want to play a certain video, that starts off almost tout de suite. Recently played videos or accessed apps are also highlighted on the home screen. Desired apps can be launched through a simple voice-based search by Alexa. For UK subscribers, catch-up services from each of the major broadcasters are present (including UKTV), as are Netflix and Amazon Prime Instant Video. In the US there are even more options like Hulu, Sling TV and the new channel DISH Now from DISH service for customers, that allows streaming content from the Hopper to the Amazon Fire TV remotely from anywhere globally.